Mangaluru, June 29, 2018: He is a rationalist, a social worker, Dalit activist, human rights activist and writer all rolled into one. He is an upright man who is uncompromising on the principles that he has adopted in life. For Krishnappa Konchady, serving the society is above everything else. He belongs to the Mugera community considered one of the most primitive scheduled castes of this area. Krishnappa had his early education at the Sri Ramashrama school at Konchady. After graduating in Arts from St Aloysius College, he did his LLB, MA in History and Economics, MBA and MSc in Geography. Now he has a doctorate in History from Hampi University to his credit. He has also succeeded in the Associateship Examination conducted by the Insurance Institute of India, considered difficult to crack. Krishnappa who was more interested in the student movement in his early days was also drawn towards rationalist thinking and action in life after he met eminent rationalist Prof. Narendra Nayak at a very young age. He is a District Committee member of CPI(M), Joint Secretary of District Rationalists’ Association and Joint Secretary of Progressive Thinkers Forum. 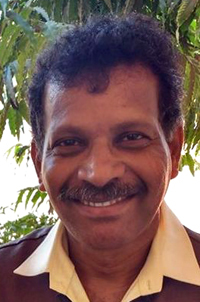 In 2001, Krishnappa was a part of the Indian delegation which participated in the International Student and Youth Festival held at Algiers, the capital of Algeria. He has tried his hands at writing by authoring two books and translating four books from English to Kannada. Having spent all his life working for the trade union movement he refused many jobs and promotions and remains a clerk in the LIC.